What Makes a Dentist in Ocala, FL Worth 5-Stars? You can read reviews for just about anything online these days, including movies, restaurants, and even cemeteries. Of course, that also includes your dentist in Ocala, FL. 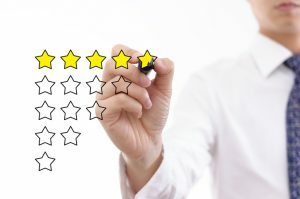 When you see that a practice like Weldon General and Cosmetic Dentistry has almost 100 5-star reviews, what does that actually mean? What compels their patients to share their positive experiences? Should it actually affect who you choose to take care of your teeth? Today, we’re going to share just a few ways that Dr. Daniel Weldon and his team continue to earn glowing reviews, and what that means for you. When it comes to any business, be it a dental practice or a grocery store, the best kind of service starts as soon as you walk in the door. If you read some of Dr. Weldon’s reviews, you’ll keep seeing how patients felt they were completely taken care of from the moment they arrived. A friendly face greeted them, the office was warm and inviting, and everything was focused on making them feel comfortable. Multiple patients mention how friendly Dr. Weldon is, and how he always takes extra time to answer their questions. All this effort before treatment even begins is paramount to a patient’s experience, and you can see the lasting impression it makes on the Ocala residents who come to see him. Whether people came in for a standard check-up, had a missing tooth replaced, or simply wanted their smile to be a little more eye-catching, you’ll see that Dr. Weldon and his team were able to take care of it. This complete approach to dentistry makes it so much simpler for the residents of Ocala and its neighboring cities to take care of their teeth. You’ll also notice that people repeatedly mention how gentle and painless all of their treatment was, and that they never thought they would have such a pleasant experience at the dentist. Whether they were a regular patient or hadn’t been to the dentist in years, they were able to get exactly what they needed, and were treated in such a way that they will be happy to return in the future. You might be asking who is actually providing all of this care, and how can you trust them with your teeth? Dr. Weldon received his dental degree from the University of Florida College of Dentistry in 2008, and continued his education with the world-renowned Spear Education. He is currently a member of the American Dental Association, the Florida Dental Association, and the American Academy of Dental Sleep Medicine. He continually expands his knowledge so he can better treat his patients, and stays current with the newest technology and techniques available. What does this all mean for you, though? It means that whenever you come into Dr. Weldon’s office, you can be confident that he’ll be able to provide the top-quality care that you need from your family dentist in Ocala, FL. You can have the peace of mind so many other patients lack when getting dental care. This all seems very simple, but if it was that easy, all dental practices would have 5-star reviews. The truth is that they don’t because they can’t provide the level of service and care people get from Dr. Weldon and his team. That’s why their patients don’t take their own time to write reviews and talk about what a great experience they had. At Weldon General and Cosmetic Dentistry, you’ll feel the difference a 5-star dental practice can make, and we’ll be sure you’ll be eager to talk about your experience afterward as well. If you’d like to know more about all of the services Dr. Weldon offers, or are ready to schedule an appointment, please call us today! Comments Off on What Makes a Dentist in Ocala, FL Worth 5-Stars?